This media console is part of our living room makeover. 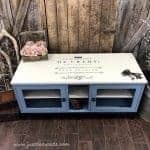 Initially, I had plans to replace it with a painted buffet or dresser from my inventory. I figured I would sell this one and grab an unfinished piece from my stash to paint, but that just seemed wasteful since this media cabinet is barely two years old. Hence the final decision to keep this and jazz it up a bit, besides it has an electric fireplace, so in hindsight, it was a no-brainer to keep it. Make sure to stick around until wayyyyy at the bottom of the post, there’s a special treat down there for you as well! You get to meet some awesome peeps. 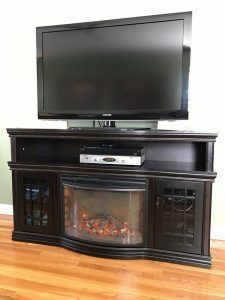 I do love this tv stand set up, but hate how dark it is. 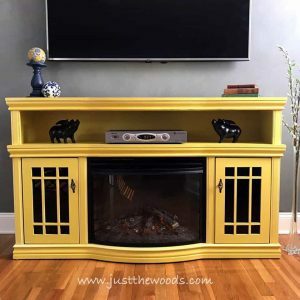 I ordered it online a couple of years ago and love the electric fireplace inside since we don’t have a real fireplace in our home. You can get one (or something similar) HERE if you love it too. To start, the electric fireplace was removed from the center and the glass was removed from the side doors, as well as the hardware. I was then able to lightly sand the entire piece and get it cleaned before painting. I do confess that I often cut corners when I work on my own projects for my home for a few reasons. For starters, I like to ‘test’ the product and see how well it holds up if I don’t do a thorough prep, I also know that if for some reason it doesn’t hold up I can always easily fix it if necessary. I am happy to say, though, of all the finished pieces in my home where I have cut corners, everything has held up beautifully, even with my two wild kids. 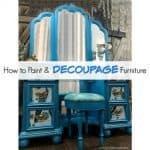 This is my full process for How to Prep Painted Furniture. 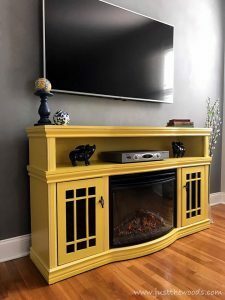 The media console was painted with bold yellow. It really is a happy sunshine yellow! 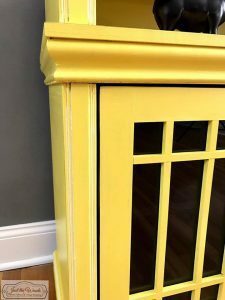 I am not even a yellow loving kind of girl, but this color is amazing. 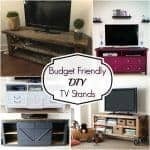 Considering I had to cover such a dark color piece, I pretty much expected the media stand to need three coats, so I was mentally prepared for that 😉 As you can see I also painted in the living room, so wheelies and a drop cloth were a must. 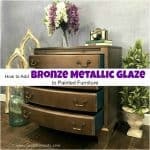 You can find great quality furniture paint and stain online HERE. Search for the color ‘Daisy’ if you want a bright sunshine yellow! 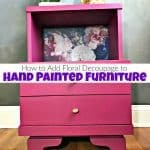 An added bonus, when painting furniture, you want to make sure to use quality non-toxic furniture paint. 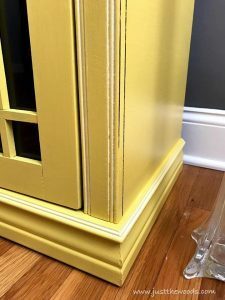 Once I was satisfied with my bold yellow paint finish I decided to add a subtle white glaze in the crevices. I chose a pure stark white to paint in the crevices and then wipe away immediately with a rag to leave just a touch of white in the creases. The piece was then lightly distressed along the edges and sealed for protection. The inside of the side cabinets were also left unpainted because I prefer to keep them dark. Painting inside would allow you to see all the crap things that are kept in there and I prefer those random items be less visible. I confess that I am smitten with this color. 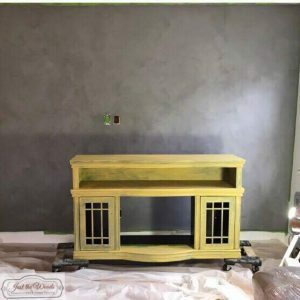 Painting the wall was also part of the room makeover and if you would like to see how I achieved that matte cloudy finish, you can find that post here – Cloudy Painted Wall with Lime Paint. Wait Don’t Go!! 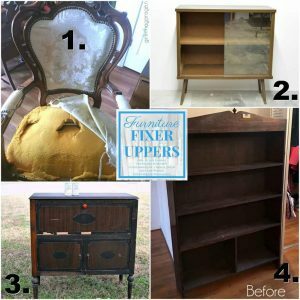 I’ve teamed up with some amazingly talented furniture fixer uppers and bloggers to share with you what they’ve been working on too! You don’t want to miss this! These ladies have some great things to check out so make sure to click the corresponding link under the photo of ugly before’s to see the amazing afters! 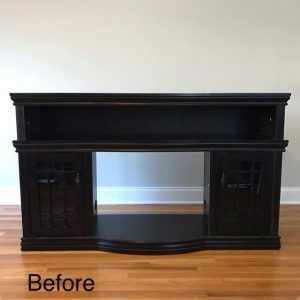 Wow, Kandice, you transformed that media cabinet into a fine piece of furniture. I’m not much of a yellow person but that is stunning! Smart idea keeping the inside dark not only because it hides the stuff inside but it doesn’t compete with that pretty yellow. 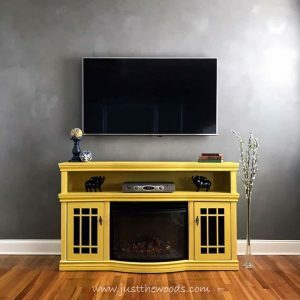 I see you got a new tv to go with that pretty new wall. Girl! You had me at yellow but the white glaze had me smiling. That’s the way I glaze too. I agree with keeping the inside dark so the “crap” doesn’t stand out. Love the media cabinet now. I LOVE this pop of color! The yellow looks fantastic, and is so cheerful. Thanks for linking up with our Merry Monday party this week. OOOh Kandice, I just love this bold color choice with the glaze just beautiful it makes me so happy! 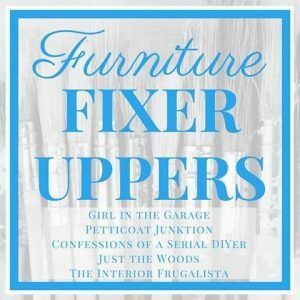 All the ladies projects were great, cant wait to see what yall round up for the next Fixer Uppers! 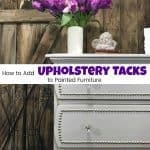 Thanks for sharing such a great post at Fridays furniture Fix! 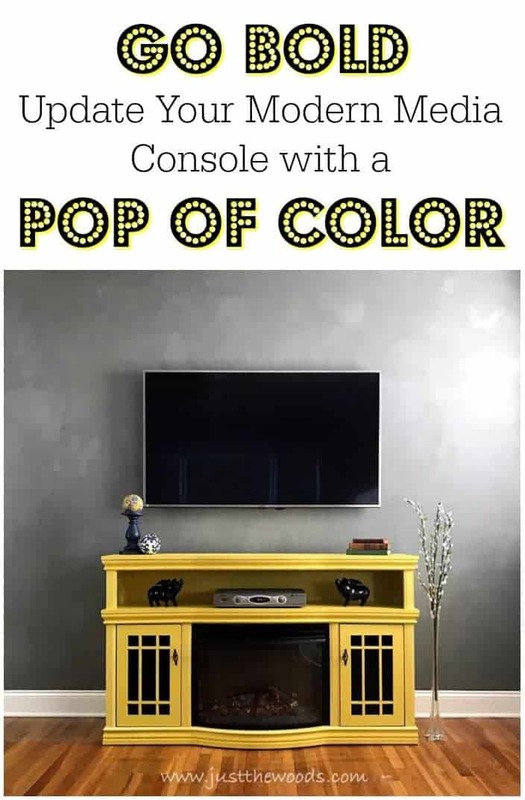 I love this TV console and the bold color you chose. I did notice it when I saw your living room reveal earlier today. You have great taste and daring in your design style! What an awesome transformation! Thanks for linking up at Funtastic Friday. 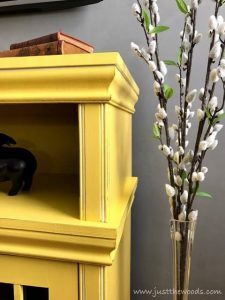 Yellow is a color I’ve wanted to try on a furniture piece and this really makes me want to do it even more! I think it’ll be my desk. I mean, I need something bright and happy when I’m working 😉 It’s just gorgeous! I am curious, is this piece real wood, or the particle board type furniture?? I have an electric fireplace console, but is is the particle board. I am wondering about painting these type of surfaces and how to go about it. Will the paint stick?? Looks good. The color is perfect! So I am confused. The yellow is called Sunshine Yellow and who makes it?